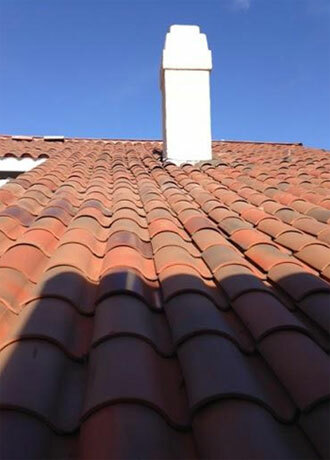 S&L Roofing is South Orange County's trusted choice for residential clay and cement tile roof maintenance and repair. At S&L Roofing, we are committed to the long-term health and functionality of our clients' residential roofing systems, and perform all of our maintenance and repair services keeping this vision in mind. We pride ourselves on our ability to get to the root of home roof problems, and then resolve these problems in the most efficient and cost-effective manner possible. We are excellent craftsmen, and carefully design and precision-install all of the roofing repairs we execute to blend seamlessly with the existing roof, carefully matching the existing roofing material and existing design layout. Clay and cement tile roofs add Old World ambiance to residential architecture. Yet often these beautiful roofing systems are not installed using the best methods possible, which can lead to roof problems such as tile slippage, exposed felt, and consequent roof leaks as these roofs age. Over time, tile mortar tends to crack and corrode, making the roof susceptible to the damaging effects of rough weather. This mortar needs to be repaired or completely replaced. In addition, excessive debris buildup in roof valleys and other roof transition areas can lead to improper roof drainage, leading to eventual roof damage. Call the roof maintenance and repair specialists at S&L Roofing today. 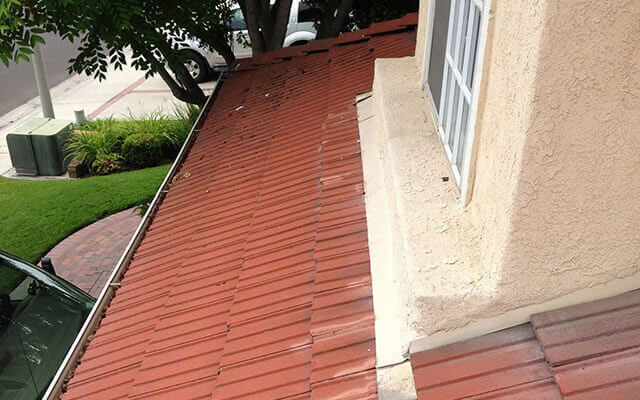 We provide our affordable roof inspection, preventative maintenance, and repair services to all of South Orange County, and provide free maintenance and repair estimates throughout our service area. Check for missing, cracked, or loose tiles; exposed tile underlayment - repair or replace as needed. Evaluate the roof for tile movement, in areas where the tiles are not individually attached to the roof deck. Repair or replace tile mortar if cracking or deterioration found. Check for debris buildup in the field of the roof, as well as in roof valleys, crickets, roof drains, and rain gutters - perform roof cleaning services. 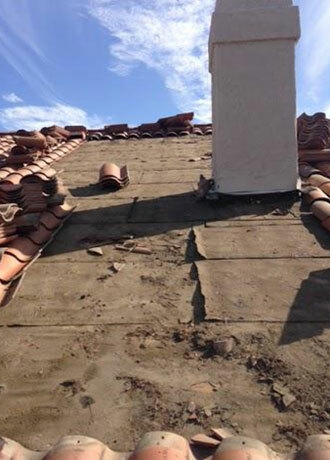 Before: This is a roof leak repair in Mission Viejo, CA. After examining the residence for water damage defects (stains, rust, mold) we were able to trace the flow marks and accurately locate the source of the roof leak.